"Xoi Trung Kien" is one of specialities and traditional food of Tay people and appreciated as a childhood gift of children living in the Northern mountains of Vietnam. 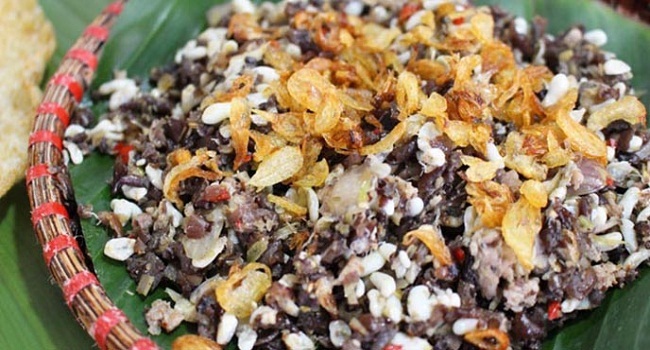 If you have a chance to try this food once time, you will be definitely attracted by the aroma and unique taste of sticky rice, dried onions blended with chicken fat and ant eggs. The crispy sounds of ant eggs seem to melt in the mouth and bring to you an unforgettable experience in your life. Have you ever drunk beer in Vietnam? Tay is the second big ethnic group in 54 peoples in Vietnam, ranked after Kinh people. Their villages are often built near rivers, streams and in forests, which significantly affect their cuisine culture. They bring nature elements to make their own food, imprinting their traditional customs and culture. One of these dishes is glutinous sticky rice with ant eggs. In spring, during March and April, the locals will go into the forests to collect ant eggs because this is a golden time when ants reproduce widely eggs in jungles. It is noted that not all kinds of ant eggs are edible; however, only eggs of black ants that built their nests on trees could used to make this sticky rice. In addition, black ants can reproduce biggest and sweet ones to serve the taste of eaters. The locals even have to walk inside the forest the whole day will be able to find an ant nest on the high trees to collect eggs. You need to be very careful to remove leaves, wood chips and mother ants. These tiny eggs are cleaned gently with warm water and mixed with seasonings, dried onions and fried with fat until the eggs spread the nice aroma. Then ant eggs will be stored in banana leaves to keep and add more flavors for it. While the steamed glutinous rice is cooked and soft then they will mix texture with ant eggs delicately and carefully to avoid breaking the eggs. You should take a small pinch of sticky rice to enjoy the crunchy crispy in your mouth with scent of fresh glutinous rice and fat taste of pickled fried onions in oil on the top. The taste of Northwest region seems to be embodied perfectly in this dish. Moreover, Tay people often serve this food on the altar to worship ancestors and gods in festivals and anniversaries in the year.